It has been proven that It takes 80% more time & money to attract new customers than it does to keep current ones. So The Groomer's Profit Kit provides you with several ready to go materials and strategies that will guarantee that your current clients will not only keep coming back to you but will also refer you to their friends! Appointment cards printed on the back of the business cards will help to cut down on no-shows. 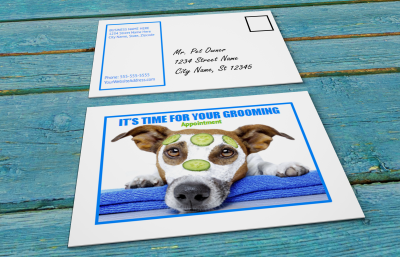 There is an editable appointment card template included with the advanced edition of the Groomer’s Profit Kit, along with over a dozen business card template designs. This will allow you to print out your own cards for just pennies! Simply edit, print onto cardstock paper and cut. Postcards are a handy way to reach out to customers who have not been in, in awhile. You will be able to print out postcards for pennies with the postcard templates that are included in our kit. They work best when printed on heavy cardstock paper(available for around $5/ream at any Walmart ). Ideally, postcard mailings are done twice a year, every six months. This project may be easier to complete if you work on addressing just a few each day when you have downtime. Postcard templates are included in our advanced kit. The basic kit does include one non-editable printable postcard. The kit's client record forms and pet release forms make it easy to keep detailed records of each client’s grooming service. The information will be useful when customers return and will enable your salon to provide consistent service to the client. Inconsistent service is a common complaint heard from grooming customers. So taking notes of exactly what was done at each appointment will eliminate that possibility and will help to keep customers happy and loyal to you. 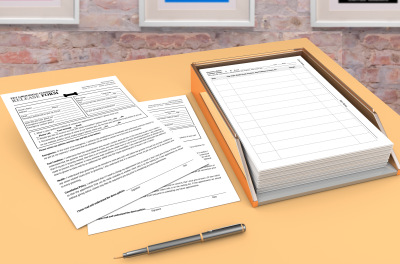 The pet release form is an easy way to quickly update your client's contact information and signature every 12 months. Pet Report Cards provide that added personal touch that puts a smile on client’s faces. Personal touches like this, help to keep customers loyal to you. 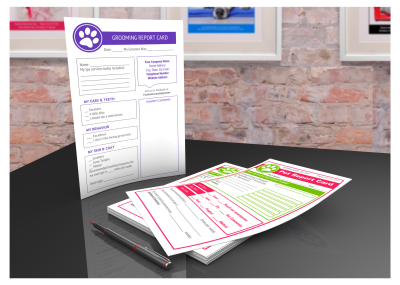 A printable pet report card is included in our basic kit. 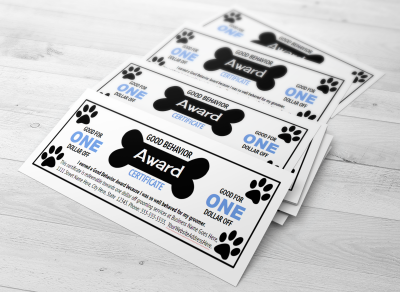 Several editable pet report card designs are included in our advanced kit with templates. Pet report cards are also an excellent communication tool to inform clients if their pet has any noticeable health issues as well. Things like this can often get forgotten in a busy salon but the report cards will help to ensure that all clients are given that one on one attention even when things get busy. Customer reward cards can make customers feel appreciated and offers them an incentive for staying loyal. They also help to cut down on customers getting enticed to try a new salon due to coupons or discounts that they see in advertisements. DIY rewards card templates are included in the Groomer’s Profit Kit Advanced edition. Allowing you to print out your own customer punch cards for just pennies. Printable signs and a Facebook cheat sheet are included in our advanced kit. 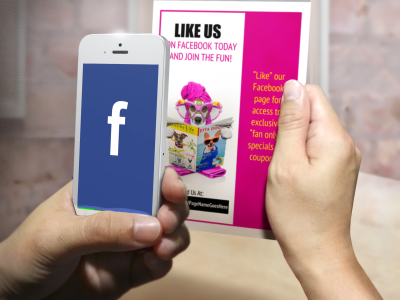 You can easily stay in touch and engage with customers by getting them to like your Facebook fanpage. This is easier to do if you display a sign in your salon. The sign will encourage customers to “like” your Facebook page. Once they like your page, you will then be able to connect & nurture your relationship with them each time you post to your Facebook page. Editable templates for posting material, signage and page graphics are all included in our advanced Groomer's Profit Kit.